Hi Folks, we will be working with Matt to set up the EFIKA2 Developer Program. 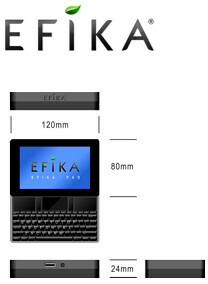 The EFIKA2 will feature the Freescale MPC5121e with has an integrated PowerVR graphic core. Of course, priority of sponsored boards and systems will go to the Developers that have participated and posted here in the Forums and on their existing EFIKA Project blog. We will be launching the new AURA Firmware on this board. Last edited by bbrv on Tue Mar 25, 2008 6:47 am, edited 1 time in total. Best of luck! Sounds like a superb board. That chip sounds as if it will do wonders to decrease the board size and increase board integration. But would the new firmware solve issues with keyboards because not every keyboard will work with the current hardware. The EFIKA2 developer program will be done in a few discrete stages. We are opening up a kind of "bounty" developer program first. The way this will work is that we will produce some ideas (please make suggestions) on projects that developers can work and cooperate on in a team. There will be no donations other than the EFIKA2 board or system - it is merely that we will post preapproved project ideas and developers can sign up to complete them or work on them. For instance for the XGI program, it could be DirectFB support, or accelerating video playback using the 3D engine/pixel shaders rather than the overlay (pretty essential for Compiz type stuff). Developers who already have good projects and are working on similar things can sign up and work together, all getting their sponsored board(s) or system(s) to work on that project. We will prioritise proven performers - certain number and quality of blog posts, actual results seen and tested, etc. Doing other work is obviously optional, but we would be concerned about the project we set out being done with the board. Once developers are signed up to that and we have some exciting stuff going on - remember, development can START with the original Efika - then we will open it up as the free-for-all design-your-own project system we had for the original program. Hopefully this will encourage developers to work better in groups, as it was harder to organise this through the projects site with many individual developers working on similar things. It will also hopefully encourage development on the more useful, user-accessible results for when the EFIKA2 hits the market. If you have any ideas you want to push forward, then here is the place to put them. There will obviously be very rudimentary 'bounty' projects - Gentoo support with a few requirements, Debian support with a few requirements. Linux kernel drivers for specific parts of the system. NetBSD, FreeBSD, OpenSolaris ports. Projects that use chip components like the AXE audio processor.. that kind of thing. So, get thinking. I have about 15 projects in mind already, I'd really like 30. Sounds good, but once an extra gfx card is no longer reqired please, please, please do not use this bulky usb/nic connector again. The thickness of the Efika is one of the biggest disadvantges this lovely board has. The new board shouldn't be much thicker than ~1" (~2.5 cm) IMO (about 1" height should be enough with a hd loaded on it). Seems like using AXE in Reggae framework may be interesting project for Efika 2 (assuming MOS will be ported to this device in the future). I would really like a Mini-ITX form factor, with two DDR2 slots. We have posted a picture of the current development board. This is not the EFIKA2, but one of the very first boards being used to validate the 5121e. Things are looking good so far. nice prototype, looks like a mini-itx board. I agree with Ironfist, enough with custom form factors and painful case desgns. Mini-itx or even better, nano-itx are very good form factors with plenty of (expensive though) accessories available. It's only a shame that we'll have to stick with IDE again. can't wait to see the new board ! R&B do freescale do a PowerVR SGX version?, it would be far more future proof if they did and that was used in product dont you think?. the only reference i can find is the PowerVR MBX Lite. its seems its going to be hard today beating these types of product with on board WiFi. perhaps PPC car/mobile HW should have moved a bit quicker as i advocated, still theres lots of potential if the final Efika2 has the right mix of future proof chips and re-programable FPGA in all product for later innovative use. and i still think not putting wifi onboard as standard on all product today, preferably 11N this late in the day with so many 11n chips now certifyed would be a mistake. and a jumper/programable switch to disable its power if you like/must and dont currently need it for your project, you will find a use though as its mobile. I followed one or two of the links above but it wasn't clear to me if there's a 32 or 64 bit path between cpu and memory. While I'm asking, is this system's memory going to be upgradable? What if any plan is there for this board and MorphOS? Is this board intended to co-exist with the first Efika or is the first Efika at the end of it's life? The first EFIKA will be available for some time, but we are headed to the next one with more of an emphasis on the final product.